Here is the challenge: I would like to enable or disable some action-sets according to the perspective the user activates. This should be done through a customization plug-in, because I'm not allowed to directly modify the code of the RCP application. I can only contribute my modifications through a new plug-in. Let's walk through the necessary implementation steps. * null if called from a non-UI thread. * if it is called outside of the UI thread. Now let us face the second problem. I would like to disable or enable some action-sets on perspective change. 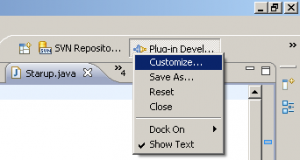 In the eclipse IDE, you can customize a given perspective using the right mouse click on the corresponding perspective icons (see the screenshot below). 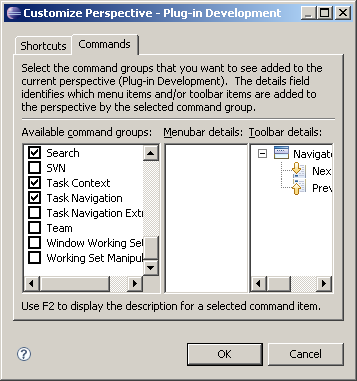 This opens a dialog where you can select the command groups (e.g. action-sets) that should be disabled in the workbench as shown in the following screenshot. P.S. 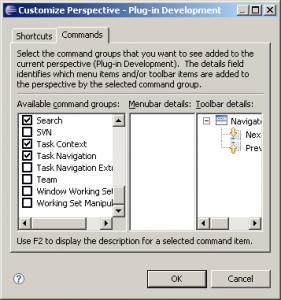 : In the example above, all search related actions (denoted by the ID 'org.eclipse.search.searchActionSet') will disappear if you set the debug perspective (denoted by the ID 'org.eclipse.debug.ui.DebugPerspective') as the active one. For more details check out the source code of the project PerspectiveActionSets from the google code repository http://homeworks.googlecode.com/svn/trunk/ or download the plug-in project under the link below.